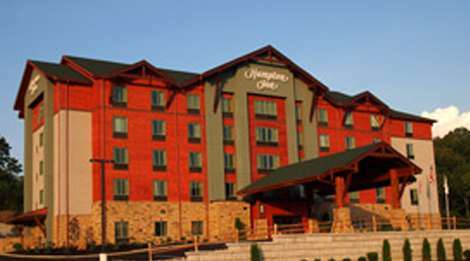 The Hampton Inn Pigeon Forge is located just off the Parkway, in the heart of downtown Pigeon Forge. It is only 4 miles from Dollywood and Dolly’s Splash Country. The Hampton Inn hotel offers the natural beauty of the Great Smoky Mountains, as well as the convenience of all the restaurants, shopping and attractions that Pigeon Forge has to offer. The hotel features spacious guest rooms with modern decor and all the conveniences for today’s traveler. Along with free wireless HSIA, flat screen HDTV’s and luxurious bedding, the hotel also has an indoor heated pool, outdoor pool and kiddie pool, business center, well-equipped fitness center, guest laundry. Plus the Pigeon Forge Fun Time Trolley has a stop, right out front. Guests will also enjoy a complimentary On the House® hot breakfast, On the Run? Hampton Breakfast Bags (Monday – Friday) and the satisfaction of the 100% Hampton Guarantee.